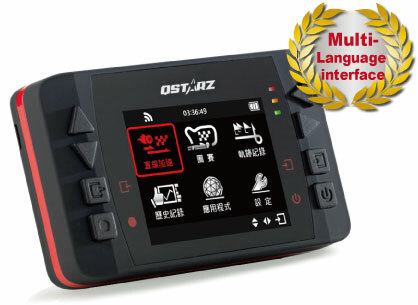 Today QSTARZ officially released GPS Lap Timer Color LT-Q6000 embedded with Traditional Chinese and Japanese Multi-language edition. QSTARZ LT-Q6000 keeps earning good rating and reputation since the first released on Dec, 2011, which can be only performed with English interface. However, under QSTARZ development team’s soonest efforts, in 4 mouths QSTARZ completed and unveiled the first GPS Lap Timer with Chinese/Japanese interface worldwide. This shows QSTARZ international listen to user’s experience and options and the emphasis on Asian market. QSTARZ product department always seriously listens to each user experience in the process of product developing. We did better adjustment on display of font and data in this edition as well. Therefore, racers can read important information they need more easily and clearly during the racing. In order to serve those users who purchased LT-Q6000 with English version before, LT-Q6000 can support on-device firmware upgrade. You can immediately download the latest firmware from Qstarz website and update to Chinese or Japanese edition with simple steps instructed.